To me, there is something about a glistening glass bottle of Coca-Cola that screams summer. The beads of condensation sweating from the sides represent the hot hot heat beating down from the sky. When I was a little girl, I can remember bottles of soda being a few and far between treat. My mom was (and is) a bit of a healthy-foods nut. I can just picture the CD-sized chocolate chip cookie sitting on the counter top being split four ways so that I could "enjoy it more than one night." How lame. So no soda and no desserts. If you told my seven-year-old self that I would one day be eating a chocolate and Coca-Cola cake, I might just die happy on the spot. Good thing I held out for 16 years before I tried it. If you are thinking that you've seen this recipe before, you're right; however, it is good enough that it deserves another plug. So, whip out your nostalgia for the days where you drank coke at the swimming pool with skinned knees and one piece bathing suits. Make this immediately... you will be glad you did! 1. Preheat oven to 335degrees and place the baking rack in the middle position. Grease two 9x2 inch round pans and line with parchment paper. Measure dry ingredients (flour, cocoa, salt and marshmallows) in one bowl and wet ingredients (coca-cola, milk) in another. Whisk each to combine and set aside. 2. Combine butter and sugar in a bowl and mix with mixer on low speed for about 3-4 minutes. Add eggs one at a time, mixing well after each. Alternately add the dry and wet ingredients about a quarter at a time without pausing between additions. 3. Pour batter into prepared pans and bake about 30 minutes (edges will be just crispy and a toothpick should come out clean in the center). Cool cakes 15 minutes and invert onto a wire rack. 4. Allow cakes to cool completely before assembling with buttercream. Finish the cake by adding chocolate curls on top and mini marshmallows along the side(To make chocolate shavings, run a veggie peeler along the slightly softened bar of chocolate (make sure it's good quality!) allowing a curl to form. 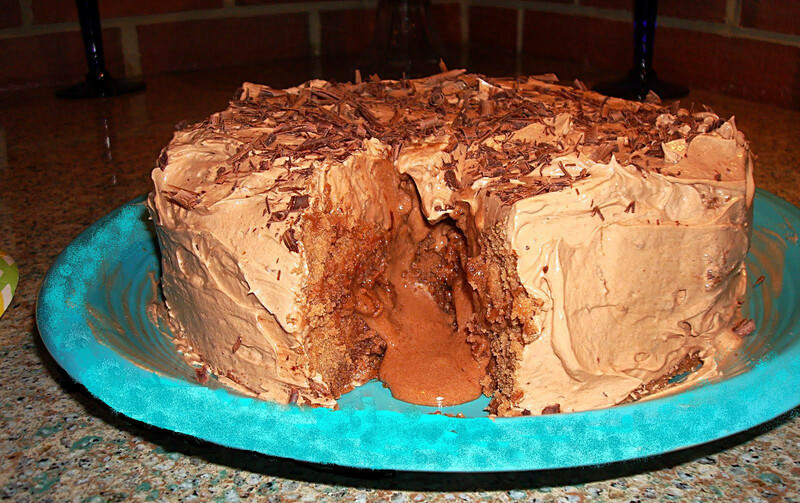 Let the chocolate fall all over the cake. 1. Quickly whisk together 4 tbsp of the milk with flour. It will be thick, so make sure you whisk it until smooth. Press out any lumps. 3. Remove pan from heat, cover with lid, and cool for about 15-30 minutes. You can also cover with plastic wrap directly against surface. (This prevents a film or skin to form on the top of the chocolate). 4. Meanwhile, combine butter and sugar in the bowl of a mixer and beat on high speed. Add contents from the pot to mixer and continue to beat on high until the buttercream is smooth (about 4 minutes or so) Beat in vanilla and and chocolate slowly. Put the word Diet in front of that description of a glass of Coke and you've got my addiction nailed.Wow, ti looks ooey-gooey delicious. How interesting! How does the coke affect the cake? How decadent! I've never had coke and chocolate... but it sounds wonderful! This looks so delicious! It has been ages since I've had a cola cake. Interesting idea to combine the soda pop with a chocolate cake. I'd never heard of such a thing before.